On Jul. 6, 2013, at around 11.28 LT, Asiana Air 214 Heavy (OZ214), a Boeing 777-200 (HL7742) operated by Asiana Airlines from Seoul to San Francisco International with 291 people on board, crash landed on runway 28L at KSFO. As a consequence of the impact with the ground the tail separated along with several parts of the fuselage, undercarriage and engine before the main part of the airframe came to a rest next to the runway. Two passengers died and 49 were seriously wounded. Based on the reports and analysis of the images of the wreckage, it seems that the 777 touched the ground short of runway threshold. 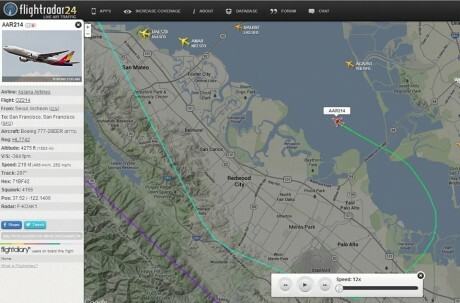 Asiana representatives said the aircraft did not suffer any technical failure. However, the NTSB investigation will say what went wrong. In the meanwhile, we can try to analyse the details already availabel. The aircraft flew the approach as expected: under VMC (Visual Meteorological Conditions) with visual final (since the ILS was under maintenance according to NOTAM for KSFO). The playback feature of Flightradar24.com for AAR214 shows the standard route for 28L. Still, by comparing the type of approach flown on the day of the incident and the one flown for instance on Jul. 4 (again with FR24 playback), you’ll notice that on Jul. 6, the final approach started a bit higher. This is not a big deal, unless the crew set a steep approach that, for one reason or another one, did not properly correct until the aircraft was a few feet above the water. Indeed, the Vertical Speed (at least the one broadcast using ADS-B by the airplane and recorded by FR24) is higher than one would expect (-1,536 fpm at 1,000 ft). Few seconds later, as the aircraft is at 75 feet of altitude, the airspeed falls to 85 kts with a vertical speed of -768 fpm, meaning that the plane is almost falling from the sky. 2) the flying pilot flew the final approach higher and faster than expected: you can compare the approach of the AAR214 with the one of the All Nippon B777 that preceeded it. Abeam Coyote point, the ANA8 (NH7) is at 1,500 ft, -896fpm of vertical speed and 167 kts of horizontal speed whereas the doomed AAR214 is at 2,175 ft, -1,152 fpm and 186 kts. In other words, the Asiana was higher, faster and descending steeper (spoilers, full flaps etc) to intercept the proper glide path. 3) Most probably for a human error (whose root cause may be attention focused elsewhere, another type of cabin problem, distraction, not enough experience in flying visual approaches with the type, etc.) 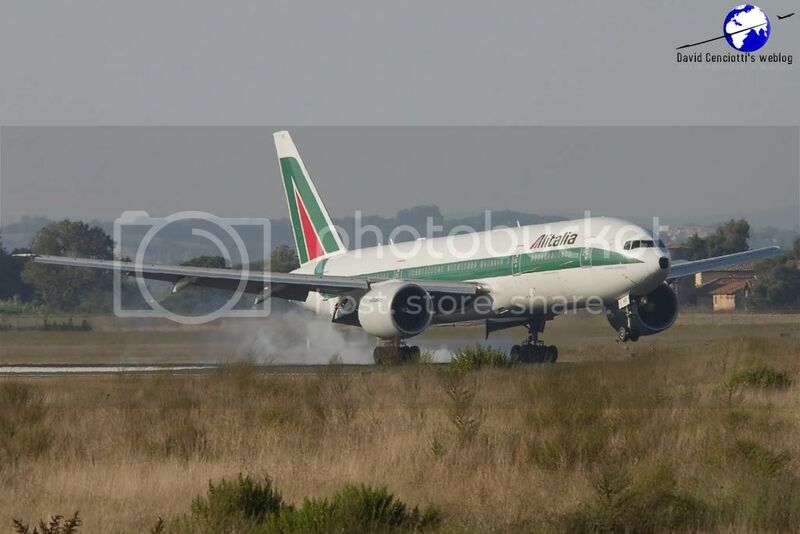 the aircraft approached the runway with a steep angle, the pilots tried to correct it with a bit of nose up to make it to the runway and avoid the plane from touching down before the threshold (if not in the sea) and this caused the aircraft to strike its tail first and then fall on the runway. 4) All the incident unfolded in front of UAL 885. Investigator will probably get some interesting details not only from the crew and CVR (Cockpit Voice Recorder) but also from the pilots of the United 885, a B747 holding short for departure to Osaka. The above development is coherent with the video just released by the CNN. You can see the final seconds of the flight: the B777 looks slow on final with a significant nose up attitude. It is struggling to remain in the air enough to get into the runway. Beware: the video shows the very last part of the flight, when the pilot flying the plane has already applied the correction (advancing throttles to gain speed). Noteworthy is also how the aircraft pivoted after impacting the ground: it’s a miracle almost everyone survived the incident. Update: it looks like the pilot flying was actually in training, had just 43 hours of experience with the B777 and had never landed at San Francisco before. These could be contributing factors to the incident.